As protestors continue to boldly decry “corporate greed” with little definition or discernment, progressive policymakers are just as quick to push a range of wage controls and market manipulations to mitigate the supposed vices of free and open exchange. The painful irony, of course, is that the victims of such policies are not the fat-cat cronyists at the top, but the scrappy challengers at the bottom. We’ve seen it with the recent embrace of the $15 minimum wage, which continues to cripple and dismantle small businesses wherever it’s found, from Seattle to Minneapolis to California to New York. But while the wars over wages tend to be the loudest and most prominent, we mustn’t forget the pains and misfortunes due to plain-old regulatory excess, subtle and unexciting though it may be. In the restaurant industry, for example, food trucks have posed a healthy challenge to the status quo, rattling entrenched corporate interests, diminishing barriers to entry, and expanding opportunities for aspiring restaurateurs of all backgrounds. But alas, such opportunities are beginning to disappear in many cities across the country, leaving many struggling beneath the weight of a growing pile of rules and regulations. 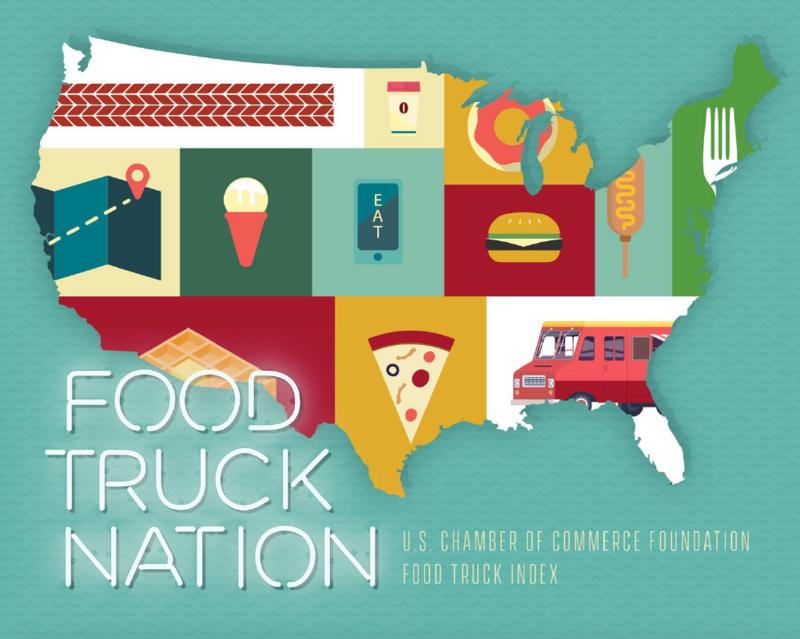 In Food Truck Nation, a new study from the U.S. Chamber of Commerce Foundation, we see the scale and severity of the damage caused by a range of these regulatory roadblocks. 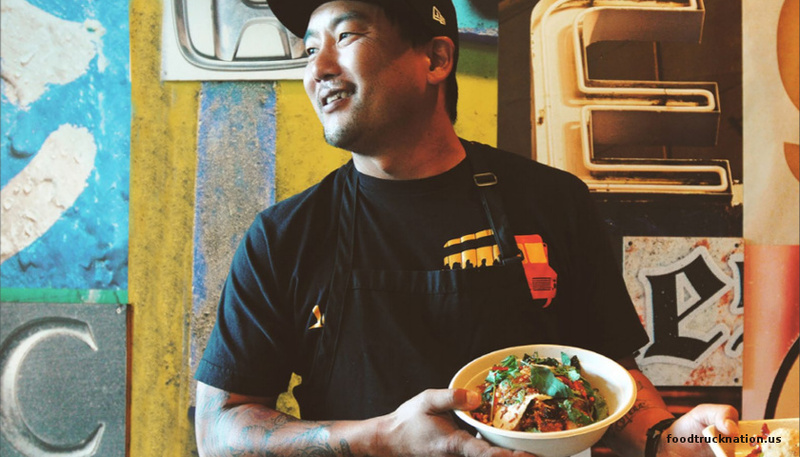 That trend of food trucks morphing into and being a part of brick-and-mortar restaurants is accelerating. 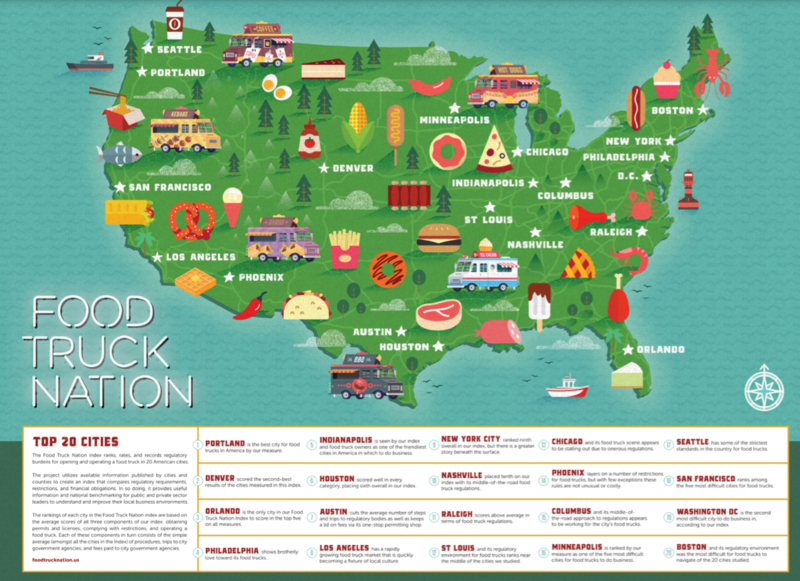 In nearly every city in which they set up shop, food trucks offer a net positive to the established restaurant industry. While official figures on that type of growth are elusive, neighborhoods where food trucks cluster, such as around Washington, D.C.’s Farragut Square, have seen visible, concomitant growth in brick-and-mortar establishments. In spite of rapid growth, regulatory barriers appear to be slowing a once hot industry. Market research by IBISWorld found that “despite strong performance…high competition and unfavorable regulatory conditions in some cities have limited the growth of industry vendors.” That report predicts food truck growth will grind to a halt over the next few years. After five years of rapid growth, expected food truck growth is now only 0.4% a year through 2020. Several of America’s largest cities are already experiencing slower, or zero, growth of their local food truck economy. The study ranks American cities by the food-truck friendliness of their regulatory climates, using average scores to indicate the ease or difficulty of three distinct activities: obtaining permits and licenses, complying with restrictions, and operating a food truck. While cities like Portland, Denver, and Orlando lead the way in friendly regulatory environments, others like San Francisco, Washington, D.C., and Boston place solidly at the bottom, each due to excessive rules, fees, and restrictions. “On average, starting and maintaining a food truck for one year requires an entrepreneur to complete 45 separate government-mandated procedures over the course of 37 business days, and spend $28,276 on permits, licenses, and ongoing legal compliance,” the study concludes. These are businesses that are vulnerable, independent, and unprotected, almost by definition. If we truly aim to expand opportunity for all, including the disadvantaged, we would do well to fight and dismantle the regulatory regimes that seek to stifle such growth. Joseph Sunde is an associate editor and writer for the Acton Institute. His work has appeared in venues such as The Federalist, First Things, The City, The Christian Post, The Stream, Charisma News, Juicy Ecumenism, Ethika Politika, Made to Flourish, and the Center for Faith and Work. Joseph resides in Minneapolis, Minnesota with his wife and four children. Just a simple question. Do the food truck operators pay a use fee for using the public roadways as their place of operation? That should be a minimum requirement. I personally am not a fan of food trucks. My biggest concern is health and sanitary considerations.